When I was a kid, I watched a movie which made me want to live in the ocean. The movie was, “Twenty Thousand Leagues Under The Sea”, starring Kirk Douglas, James Mason and Peter Lorre (who also starred in Voyage To The Bottom Of The Sea). I actually wanted to own the Nautilus and take voyages under the sea. I wanted to dive into the Mariana Trench and create an underwater city (I was six and didn’t know about water pressure at the time). This movie, and subsequently the book, sparked my imagination for a new frontier. It wasn’t just Space that had my heart, now the ocean did as well. The wonderful man to thank for that, was none other than Jules Verne, the undisputed Father of Science Fiction (unfettered, wild, screaming applause). Aside from the many amazing stories he penned, Verne was a truly forward thinking visionary. Born February 8, 1828, Verne was a futurist of the highest caliber. He predicted hydrogen as an energy source, helicopters, submarines, skyscrapers and cars. Also, in his groundbreaking story “From The Earth To The Moon”, Verne not only predicted space flight, but where that space flight would take off from–Cape Canaveral–which in his novel is Tampa Town. Verne believed that humanity was capable of many astonishing technological advances. As an inventor himself, he is responsible for influencing much of technology over the past almost 150 years. In his stories, Verne wasn’t afraid to show humanity for what we were and are. For me, Captain Nemo was only slightly deranged. Mostly, though, his outlook on humanity was one brought on from experiencing the worst that humanity had to offer. Verne, in my opinion, showed that many of our species are responding to the dirt done them by others. While Verne did shine the spotlight on our ugliness, he also shined an even larger light on the wonders which we are capable of. In stories such as “From the Earth to the Moon”, Verne highlighted our tenacity to work together against all odds to achieve a goal which had never been attempted. 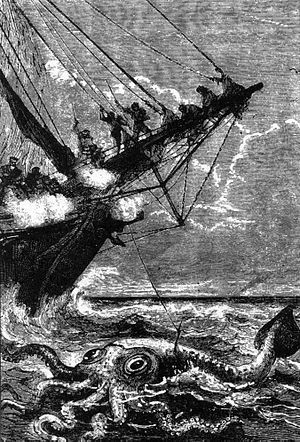 Jules Verne used his love of science and writing to depict a humanity capable of great heights, while at the same time shining a realistic light on our greed, envy, and malice. Verne proved that science fiction is not just about the science and technology. Using his understanding of our society, Verne caused his contemporaries, and everyone else throughout time, to honestly view who we are and what we are capable of. Join me next week when I interview one of my favorite authors and friends, T.S. Evans, author of “Strings On A Shadow Puppet“. We’ll discuss how his background in Archaeology has helped him to write fantastic future science fiction.